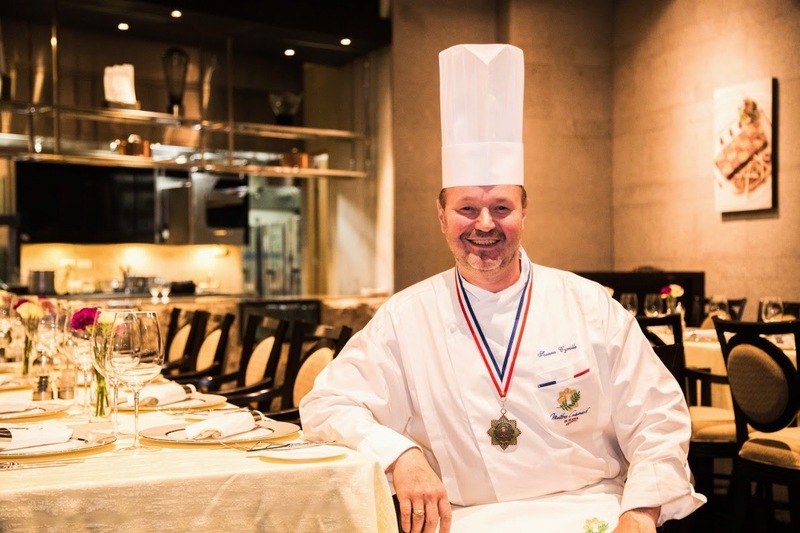 Executive chef Cyrille Soenen of Resorts World Manila’s (RWM) Impressions fine dining French restaurant was recently recognized and honored by the Maîtres Cuisiniers de France—the most envied and exclusive title that chefs around the world aspire for. Soenen is the first and only chef in the Philippines to be accorded with this honor. Maîtres Cuisiniers de France, or Master Chefs of France, are often given the highest classification in restaurant guides, and are regularly mentioned in the world’s leading food and travel magazines. Many leading chefs, the “Meilleurs Ouvriers de France” and the winners of culinary competitions belong to the Association. The organization’s motto is “to preserve and spread the French culinary arts, encourage training in cuisine, and assist professional development.” The public authorities recognize the important work carried out by Maîtres Cuisiniers de France “to preserve, advance and perpetuate the tradition of great French cuisine”. This is why they have no hesitation in granting them honorary awards, especially those of the “Ordre National de la Légion d’Honneur”, the “Ordre National du Mérite Agricole” and the “Ordre National du Mérite”. Offering a sampling of his world-class culinary skills, Chef Cyrille prepares a special menu that showcases his avant-garde approach at his French fine dining restaurant Impressions . For the entire month of April, the kind chef serves his very own recommendation of a four-course, seafood degustation set menu that fits in perfectly this season of lent. The spread starts with an appetizer of Herbed Crusted Scallops with Duo of Squash and Cauliflower Puree, Sauteed Mushroom and Pickled Radishes followed by a hearty Cream of Mussels, Herbed Parmesan Tuille, Boudin of Prawns and Butter Glazed Peas Soup. The entrée offers a choice between a plate of Roasted Codfish with Farce, Mussel Broth Ravioli, Saffron Beurre Blanc or a serving of Soy-Butter Glazed Salmon with Seaweed Risotto, Sauteed Edamame, Peas, Miso Cream Froth. The exquisite meal is topped off with a dessert of Mascarpone Vanilla Bavarois, Pistachio Micro-sponge, Chocolate Soil, with a Duo of 70% Dark and White Chocolate Gelato. For a full breadth of Chef Cyrille’s culinary creations, Impressions serves Brunch Buffets every Sundays from 11AM to 3PM. Catch a special set this coming April 5, 2015 as the chef celebrates his MCF plum with a gourmet Easter Brunch Buffet experience. Impressions is located on the 3/F of Maxims Hotel, Resorts World Manila. For reservations, call (02) 908 8883 Monday to Saturday 6 PM to 12 MN, Sunday Brunch 11 AM to 3 PM, and Sunday Dinner 6 PM to 10 PM. Resorts World Manila (RWM) is the first one-stop, non-stop entertainment and leisure destination in the Philippines that features recreational thrills, world-class performances, unique events, and exciting lifestyle options. Conveniently located across Ninoy Aquino International Airport Terminal 3, RWM is an instant gateway to world-class Philippine hospitality. This integrated lifestyle hub is home to three international lodging brands: the all-luxury suite MAXIMS Hotel; the five-star brand MARRIOTT Hotel Manila; and REMINGTON Hotel which offers cozy and superb accommodations for great value. Two more hotels—SHERATON Hotel Manila and HILTON Hotel Manila—are currently being constructed which will effectively make RWM a five-hotel integrated resort. Also home to RWM is The NEWPORT Mall which features international luxury brands. Experience a unique viewing experience at The Newport Cinemas with stadium seating and state-of-the-art cinema technology. Watch grand-scale performances at the 1,500-seater, ultra-modern Newport Performing Arts Theater (NPAT), which boasts state-of-the-art lights and sounds innovations, and the largest LED wall in all of Southeast Asia, or relax in the cozy surroundings and enjoy 24/7 entertainment provided at Bar 360. Dine in one of almost 50 restaurant outlets offering a diverse selection of local and world cuisine, paired with a wide selection of the finest wines and popular liquors. Savor the culinary offerings of Filipino and foreign chefs who have mastered their craft through extensive experience in top establishments of major cities all around the world. Spend a whole family day affair with the many attractions offered by GameZoo amusement center, including exclusive multi-dimensional virtual rides, exclusive arcade games, and more fantastic activities for kids of all ages. Amp all the thrills offered exclusively by Resorts World Manila by becoming a cardholder! Membership at RWM is free and provides an instant pass to numerous discounts, freebies, and exclusive invites to RWM events. Caption: Chef Cyrille Soenen of Resorts World Manila’s (RWM) IMPRESSIONS is the first and only chef in the Philippines to be recognized and honored by the prestigious Maîtres Cuisiniers de France (MCF).